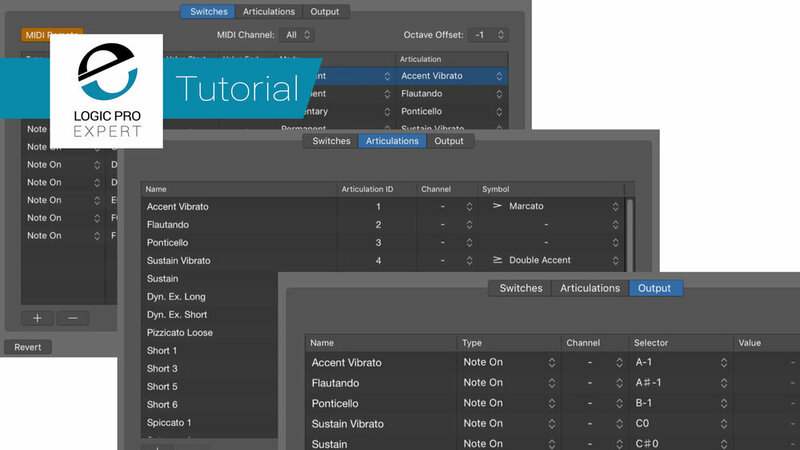 The Articulation ID Editor Switches pane is where we determine the type of MIDI message to use for switches, what values within that MIDI message, and the behavior once the switch is triggered. The first step is to activate the MIDI Remote button, so the articulation switches work with the message we will set up. Set the MIDI channel and octave offset as needed. Press the plus or minus button to add button at the bottom of the window to add (or remove) articulations from your list of key switches. Use the Type pop up menu to choose the type of MIDI message used to activate the articulation. Note on events are the most commonly used key switch message. You’ll notice that velocity is also available in this message. If you choose to use velocity as a key switch message, incoming note velocities will trigger the assigned articulation based on the values set in the Value Start and Value End fields. But once they are captured, you can freely edit the full range of note velocities in Logic’s MIDI editors without switching articulations! Depending on the MIDI message selected, you will need to set a specific value in the Selector field. For example, if you choose a note on message, here is where you select which specific note is used for the key switch. This does not have to be the same note used in the Selector field of the Output pane. The Switches pane is used to have incoming messages trigger the articulation ID. The Output pane is used to set the message that articulation ID sends out to the software instrument. For MIDI notes, the Value Start and End sliders determine the velocity range that will trigger the articulation ID. For Note On messages, you probably want to leave these either neutral ( showing a minus sign in the field) or at their maximum ranges, so that the articulation is triggered regardless of how hard you press the key switch note. The Mode pop-up menu sets the switch mode. Permanent triggers the articulation switch, and it stays on that articulation for all subsequent notes until another articulation is selected. the re-trigger variation stops the currently sounding note first. The Trigger variation applies the switch to notes that are currently playing. Momentary mode activates the key switch only while the switch is within the range defined in the Value Start and End fields. For note on messages, this means, while you are holding the note down. When you release the key switch note, the articulation reverts back. The re-trigger variation of this mode stops the current note and re-triggers it immediately with the new articulation. Trigger applies the switch immediately to currently playing notes. The toggle mode is used to activate the articulation when the key switch is engaged. And then triggers the previous articulation the next time it is engaged. The re-trigger and trigger variations work the same as they do in Permanent and Momentary modes. To set up Articulation ID’s to work with score symbols, switch to the Articulation pane. Assign a unique score symbol from the Symbol pop-up menu to each of the articulations you want to be able to control with the symbols from the score window. Dragging the symbols from the Score Window part box will then not only assign a notation marking, but will also act as an articulation switch. Articulation ID sets are automatically saved within the project you create them in. To use them in different projects, you must first save your instrument, along with its Articulation ID Set instantiated, as a Patch. Saving as a Channel Strip Setting will not marry the Articulation ID Set to the Instrument. Only Patches will. Open the Library and hit the Save button at the bottom right. Name and save your patch in the ensuing Save As Window. It will now be available as a patch in other projects.